Ahaaaa … to be featured in a Girls magazine (for the right reasons) is probably every male’s dream -- well that’s what has happened! 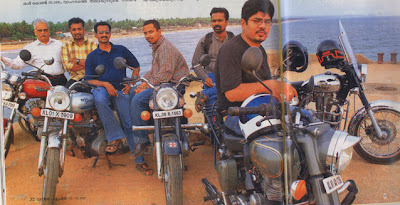 We guys at Silver-bullets have got featured in an article on our passion Royal Enfield Bullet with da Photo! . Our pics are there too - The photo concept is good –A few guys “standing out” above what seems like the middle of the ocean! We do look like a rock/pop group. True, the spirit of the Royal Enfield Bullet is what has got us together and we are in a different league - come Harley or go Harley! Other bikes may only be an addition to our bike stables! 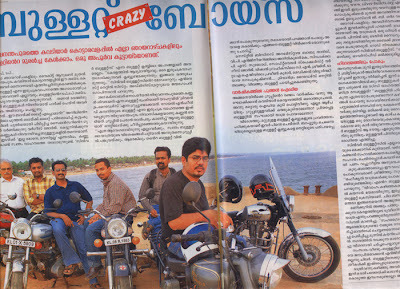 I don’t know to read Malayalam, but from what folks told me it’s a positive article on the group as a road safety Bullet enthusiasts one and the URL given has served as a promotion for the group. I had a lot of male friends and relatives calling me up and telling me my photos on the magazine. In office I had a couple of girls come up and say -- We saw the snap – great article too! Why didn’t you tell us earlier – Well the truth is frankly I thought those guys would publish only a small byline or write-up only! “ With the largest circulation figures of 4,92,892 copies and the highest readership of over 55 lakhs, Vanitha is now India's largest sold and largest read women's magazine. Just the perfect vehicle to help your brand go places in Kerala.” -- Baseline: India's largest sold and read women's fortnightly. Well that’s 15 days of stardom kinds till the next issue come out and we fade away! But I shall cherish the moments, as we need to cherish every joyous moment in our life......remembering that the star behind the whole thing is the Royal Enfield Bullet. Well … this probably goes to show that if you are truly passionate about anything – fruits (rewards and publicity) will follow though we may be content just in riding our Bullets! May more folks discover the joy in riding and caring about the RE Bullet!